Ranting on the state of the world, and pondering ways to make it better. Do you recognize this bird? Many of you know we have been living without our bird since late spring, but occasionally he seems to send us a messenger from The Beyond. As I was digging onions from the garden this afternoon, I looked up and saw a Very Large Bird in the neighbor’s maple tree. What kind of bird is this looking straight at us? It was rather unusual to see this looking down from basketball-passing distance, so I had to share the experience. I ran into the house to tell RoZ, expecting it to be gone before she could look out the kitchen window. It was still there. I grabbed the camera. Under normal circumstances, the bird would look at me as if to say, “No pictures!” and fly off. The bird stayed there, posing for several pictures. What kind of bird is this looking toward our left? We have all kinds of crazy fantasies about what kind of bird this could be. It stood about 20-25 inches (50-60 cm) tall, so it’s a very big bird. 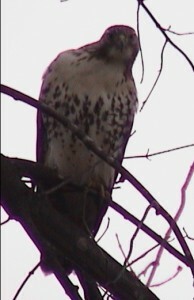 Could it be a redtail hawk? We’ve seen those, and they’ve never looked this big. Another thought is that it might be a peregrine falcon, but it doesn’t quite match the pictures in the bird books we looked at. They do live close by. What kind of bird is this looking to our right? We live in the Mississippi River flyway, a superhighway for migrating birds that gets a lot of use this time of year, so we wouldn’t be surprised if it is something strange and exotic passing thru. We know that we have readers who are far more expert than we are. Maybe one of them can tell us what kind of bird this is. All we know is that seeing this bird this close was a very magical experience. And it was very interested in the neighborhood squirrels. 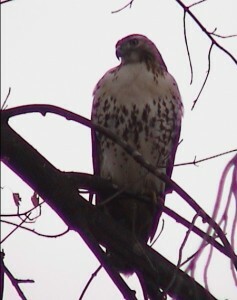 This is a light phase red tailed hawk. According to the National Audobon Society Field Guide to North American Birds it is the most common phase. In western states there appears to be darked phases as well. With breeding sites throughout, it is reported to be the most common and widespread American member of its genus. Younger birds will be more dull and more markedly streaked. 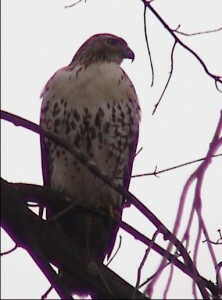 It sure looks to be a red tail. I had one sitting in a tree out side my window. I wondered what he was telling me. Now I know, we were to reconnect. I try to stay conscious of the energys around me.The animals have much to tell if you have the ears to listen. Great Article. I dont know how I landed on this page but I am glad I did. We don't clutter this site with ads, so our only source of encouragement is your generous donation. Click on the hat to throw some money into it. All content (unless otherwise acknowledged) ©1993-2019, purplearth. All rights reserved.